Decorated with an African theme throughout, Beckett cottage is a popular choice for house parties, birthday celebrations, reunions, anniversaries or family gatherings. The elegant and spacious dining room with its high ceilings, large windows, stone fireplace and original beams offers a versatile, gathering space. It sleeps 6 and can dine up to 49 guests if taken alongside other cottages. Sleeps: Can sleep up to six guests. Bedrooms: One double room. Two twin rooms. 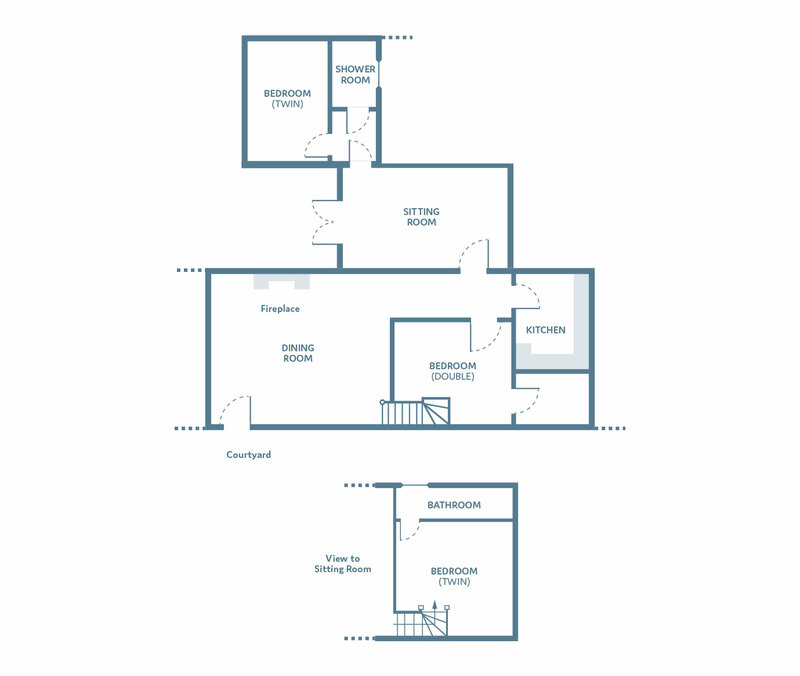 The first floor twin bedrooms can be linked to create doubles. Bathrooms: All bedrooms have en-suite bathrooms. The ground floor twin’s shower can double as a downstairs ‘loo’. You can enter the cottage from the car park. Down a garden pathway and across a private stone terrace, the doorway opens into the sitting room. This room, painted in cream and decorated with dramatic animal paintings, is warm and cosy with comfortable sofas and chairs. Step up to a small hallway, perfect for leaving coats and boots. The sitting room leads into a hallway – to the left is the well-appointed integrated kitchen with a gas stove, warming cupboard and large fridge/freezer – to the right is the dramatic dining room, painted red, with horn chandeliers and large stone fireplace and gothic mirror. Enhanced by the strong striped curtain fabrics, antique furniture and bespoke oak table. The walls are hung with contemporary paintings by a local artist. This cottage can also be entered from the main cobblestone courtyard and the adjoining cottages. This cottage is very popular with guests booking other cottages as it allows them to enjoy meals together during their stay. The twin bedroom (can be clip and linked to make a double) on the first floor has a safari tent effect over the bed enhanced by the ‘giraffe’ headboards to give this room a ‘fun’ air. The bathroom is decorated in black and white with fabulous tiles. The ground floor master bedroom has a four-poster double bed and bespoke furniture and leads into an en-suite bathroom. The third bedroom is also on the ground floor with twin beds. The private shower room just off it can double as a downstairs ‘loo’.